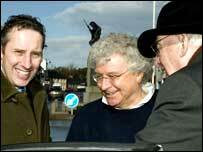 The DUP's Ian Paisley Junior has confirmed he went lobster fishing with the private developer Seymour Sweeney. 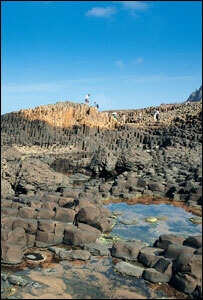 Mr Sweeney's bid to develop a visitor centre at the Giant's Causeway has stirred controversy. Mr Paisley Jr also confirmed that he and his father had lobbied in 2005 for a drift net licence on behalf of a fisherman whose crew included Mr Sweeney and two of his relatives. He told the BBC he did this because he believed in the case. Correspondence passed to the BBC shows that in 2005, both Ian Paisley Sr and his son intervened in a dispute over a drift net licence for a boat registered in Portballintrae. Mr Paisley Jr supported the claim by the longest serving crew member, Stephen McLaughlin, to inherit the licence. The DUP junior minister confirmed on Wednesday he had gone fishing with Seymour Sweeney, but insisted he had made no secret of this and knows many fishermen in his North Antrim constituency. Mr Paisley Jr said he believed his trips on the boat took place back in 2004. He has rejected calls from some political critics for a statement clarifying his relationship with Mr Sweeney, insisting he has nothing to answer. The Causeway attracts nearly 500,000 visitors a year. The previous visitors' centre on the site burned down in April 2000. Renowned for its polygonal columns of layered basalt - resulting from a volcanic eruption 60 million years ago - it is the only World Heritage Site in Northern Ireland.